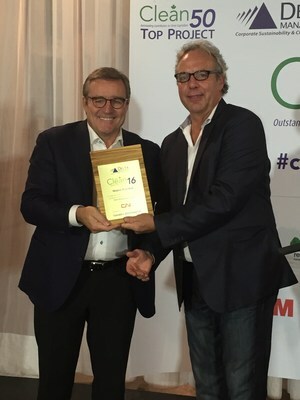 KINGSEY FALLS, QC , Oct. 1, 2018 /CNW Telbec/ - Cascades Inc. (TSX: CAS), a leader in the recovery and manufacture of green packaging and tissue products, is pleased to announce that its President and Chief Executive Officer, Mario Plourde , was a recipient of the 2019 Clean50 and Clean16 awards. Each year, Delta Management Group's Clean50 awards program honours 50 individuals who have made outstanding contributions to sustainable development and clean capitalism in Canada over the prior two years, in 16 different categories. In addition to being one of 50 award recipients selected for their achievements, innovations and ability to inspire other Canadians, Mario Plourde also distinguished himself in the "Manufacturing and Transportation" category, earning the Clean16 award.
" Mario Plourde was chosen following a rigorous search and selection process undertaken by Delta Management in consultation with internal and external advisors, and he is among the honourees selected from an initial pool of approximately 600 qualified nominees," said Gavin Pitchford , CEO of the Delta Management Group. "In continuing to build Cascades' environmental legacy, Mario has instituted initiatives such as the $2,000 electric vehicle incentive for employees and the development of innovative products with added environmental value," said Pitchford. "Mario actively supports Cascades' sustainable procurement program, which evaluates suppliers and rewards environmentally responsible ones with 5–10% advantage. Cascades' 20 energy efficiency engineers have helped the company to reduce its GHG emission intensity by 50% since 1990, and Mario has committed to a further 7% reduction by 2020. Last year, Cascades recovered 76% of its manufacturing residue for reuse, and 42% of the company's energy consumption comes from renewable sources," added Pitchford. "I share these awards with all Cascaders who work every day to make our company better by reducing our environmental footprint," Plourde emphasized. "Long before sustainable development became a trend, Cascades was already practicing it instinctively. The Lemaire brothers were recovery pioneers, and they left us a legacy that we intend to honour and develop even further for the benefit of the planet, of communities and of our customers," he said. Delta Management Group is a leading search firm specializing in sustainability professionals and green tech. It is the creator and steward of Canada's Clean50, an annual awards program founded in 2011 that honours and brings together 50 Canadian leaders in sustainable development from a broad spectrum of sectors, to build trust and foster enhanced collaboration and innovation in the fight against climate change. The Clean50 awards also honour 10 emerging leaders and the 20 best sustainable development projects of the year.